The essential guide to increase your energy, focus, strength and endurance. Before training, you should be focused on priming your internal environment for hard physical - and mental - work. Your pre-workout regimen should optimize your body and mind to maximize performance. If increased strength and gains is on your agenda for 2019, sit down and read on. 1. Boost your blood flow (and pump) with nitric oxide. Nitric oxide is a gas that's produced by your body, and one of its primary purposes is to promote vasodilation, or increased blood flow. The way you increase NO before workout is through ingredients that nudge your body to produce more nitric oxide, such as L-Arginine. Boosting nitric oxide levels can help dilate your blood vessels to get more oxygen to your muscles. Increasing blood flow to the muscles increases nutrient delivery, which has been shown to elevate protein synthesis rates. 2. Make sure you take your Beta-Alanine. Beta-alanine is a staple pre-workout ingredient with a singular purpose: helping you combat that "burning" feeling and bust out a few more reps, making the most of every set. When you perform high-intensity exercises, acidity can start to build up in your body, increasing muscle fatigue and reducing performance. Beta-alanine binds with histidine to raise levels of the amino acid carnosine, which buffers the hydrogen ions that form these acids, ultimately helping you maintain your intensity for longer periods of time. In other words: more volume; more gains. 3. Caffeine can be your best training partner. Many lifters and other athletes consider caffeine their best training partner, and for good reason. Study after study has shown that caffeine can increase alertness, sharpen focus, improve tolerance for pain caused by exercise, help burn fat, and help athletes do more work for longer periods in the gym and in sport. Caffeine gives you quick energy you can use for both endurance exercise and shorter duration, high-intensity work such as lifting or sprints. It has been shown to increase maximal strength, power, endurance, and even reduce muscle soreness. 4. Take creatine before (and after) you workout. During a high-intensity workout, creatine stores in the body are used up quickly, meaning that there is a creatine deficit in the body. This compromises your overall ability to work out and make every rep count. Creatine pre-workout helps to saturate your muscles creatine stores before you begin exercise. Keep in mind, pre-workout creatine dosage is probably less than your going to need each day, so through a scoop in your water post-workout as well. 5. Enhance your focus and motivation with nootropics pre-workout. Nootropics are typically taken to enhance cognitive performance. 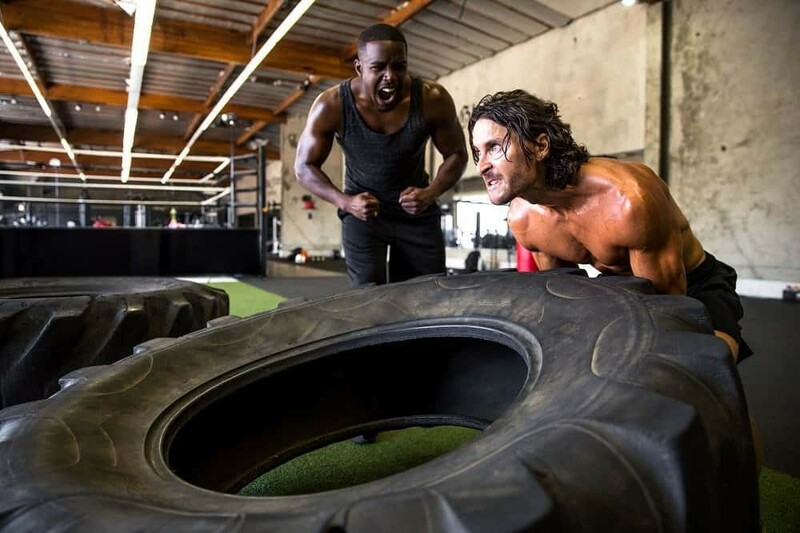 However, bodybuilders, athletes and other fitness buffs are increasingly aware that nootropics can improve their physical performance while working out, too. Nootropics can help optimize brain chemicals and cognitive functions that drive peak physical performance. Whether you are striving for one more rep or pushing yourself to go that extra mile, focus is the cognitive function that can help you to succeed. The ability to harness and concentrate one’s mental faculties on a physical activity is what the mind-body connection is all about. Strong focus can help to pump up intensity, extend endurance, and do everything else in the gym just a little bit better – which can add up to big muscle and fitness gains over time. The average lifestyle of all work and no play is hectic enough. When you need to run to the gym 3 to 5 times a week, it seems almost impossible. Thankfully, modern advances have given us the ability to regain energy and performance and all it takes is a scoop of powder in a glass of water. A pre-workout supplement is a necessary part of the health and fitness lifestyle. It ensures you give everything you have to your workout, maximizing your results. The listed supplements above are the best in the business. Shown by scientific research and studies to be the real deal, those ingredients are a must have for anyone who is serious about their physique. 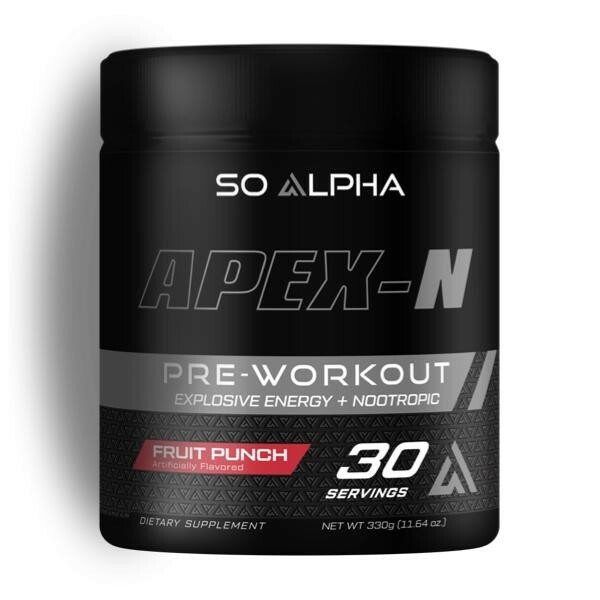 Lucky for you, So Alpha has packed every one of those ingredients into one powerful and convenient pre-workout supplement: Get your hands on APEX-N today and experience a new level of energy, focus and strength in your workout. A pre-workout supplement can help your mind and body get to that next level of energy, strength and focus you need for the best of workouts. It ensures you give everything you have when training, maximizing your results. If you're looking for a product to prime you physically and mentally to get the most out of your workouts, look for a well-rounded pre-workout that include ingredients that promote energy, strength, pump and focus — such as APEX-N.
APEX-N combines the cognitive enhancing nootropics L-Tyrosine, TeaCrine and Huperzine-A with the performance accelerators Beta Alanine, Creatine, L-Arginine, Caffeine and more for intense, sustained energy and focus, increased motivation and endurance, and the urge to lift heavy. APEX-N is here to elevate mind and body so you can power through every training session in your pursuit of harder, heavier, and more productive lifts. Get your hands on APEX-N today and experience a new level of energy, focus and strength in your workout. Beta Alanine: Already produced naturally in the body, beta alanine is an amino acid that aids in carnosine production. The presence of carnosine is critical in keeping your muscles fresh and giving them optimal endurance. It is vital in allowing you to push deeper for high-intensity workouts and heavy lifting. The ability of beta alanine to reduce fatigue makes it a must have for anyone looking to do more today than they did yesterday. Creatine Monohydrate: The importance of creatine can not be overstated. It is known as the building block ingredient for building muscle. It permits the body to quickly produce cellular energy to boost strength and promote muscle endurance. Creatine monohydrate restores ATP levels in the body encouraging heightened levels of muscle growth. Teacrine Pure: Teacrine has been used for centuries in traditional Chinese teas as a way to give massive boosts of energy and reducing fatigue without the side effects of other stimulants. It help give you the push to overcome fatigue and move your preset energy boundaries to the next level. Lear more about APEX-N here.